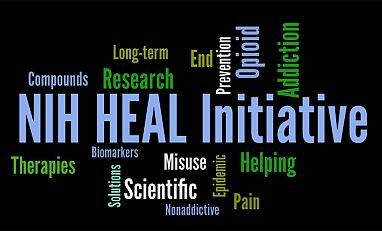 In 2017, there were 1,014 overdose deaths involving opioids in Georgia—a rate of 9.7 deaths per 100,000 persons, compared to the national rate of 14.6 deaths per 100,000 persons. 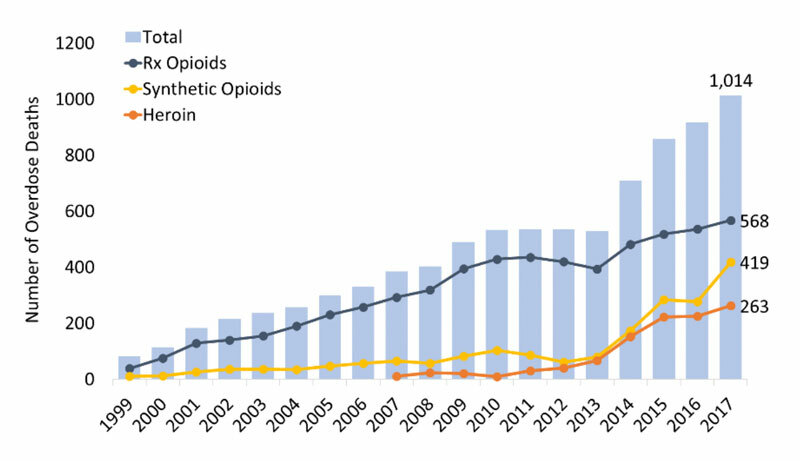 The greatest increase in opioid deaths was seen in cases involving synthetic opioids (mainly fentanyl): a rise from 61 deaths in 2012 to 419 in 2017. Deaths involving heroin also increased in the same 5-year period: from 40 to 263 deaths. The highest number of deaths in 2017— 568— involved prescription opioids (Figure 1). Figure 1. Number of overdose deaths involving opioids in the Georgia, by opioid category. Source: CDC WONDER. In 2017, Georgia providers wrote 70.9 opioid prescriptions for every 100 persons (Figure 2), compared to the average U.S. rate of 58.7 prescriptions. This is the lowest rate in the state since 2006 when this data became available (CDC). 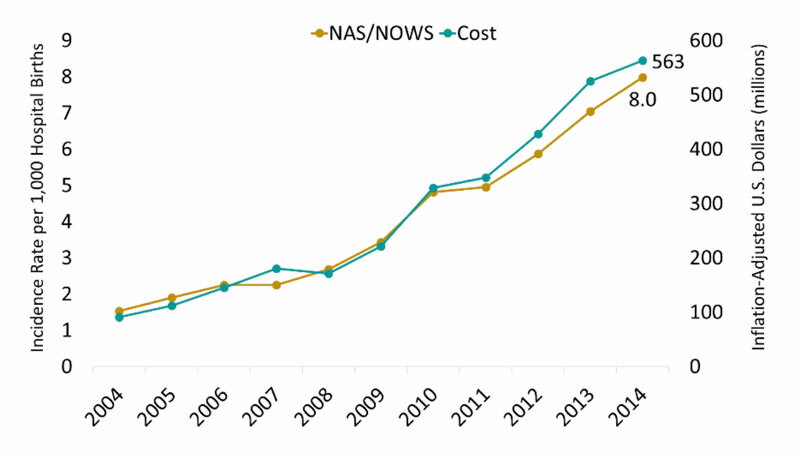 The overall rate of overdose deaths involving opioid prescriptions has risen significantly since 1999 despite a recent decline in 2013. Since then, it has increased from 3.9 deaths per 100,000 persons in 2013 to 5.4 deaths per 100,000 persons in 2017. Figure 2. 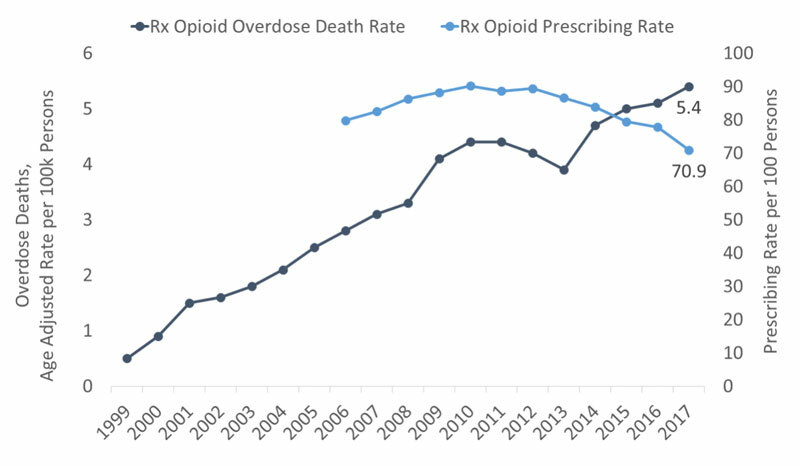 Georgia rate of overdose deaths involving prescriptions opioids and the opioid prescribing rate. Source: CDC and CDC WONDER. In 2016, there were 410 confirmed cases of NAS/NOWS from 47 of the 74 birthing facilities in Georgia. Opioids were confirmed in 20 percent of the cases (Georgia Department of Public Health). State Incidence: Of the new HIV cases in 2016, 2,709 occurred in Georgia. Among males, 4.2 percent of new HIV cases were attributed to IDU or male-to-male contact and IDU. 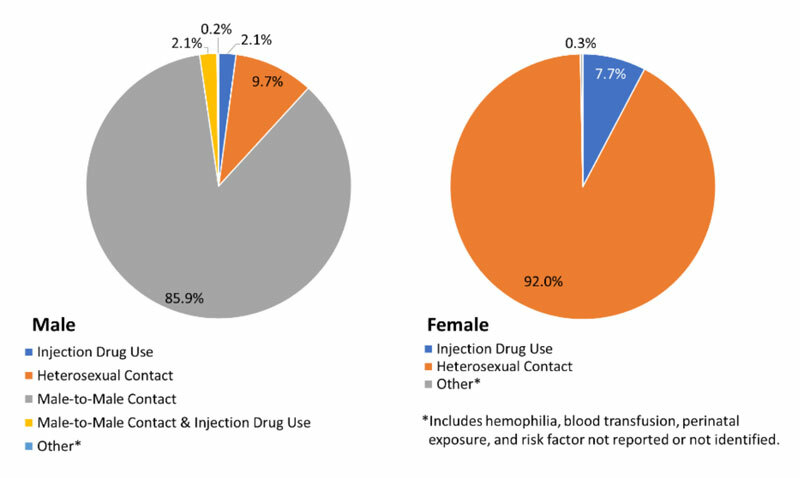 Among females, 7.7 percent of new HIV cases were attributed to IDU (Figure 4) (AIDSVu). State Prevalence: In 2015, an estimated 49,463 persons were living with a diagnosed HIV infection in Georgia—a rate of 588 cases per 100,000 persons. Of those, 12.3 percent of male cases were attributed to IDU or male-to-male contact and IDU. Among females, 15.3 percent were living with HIV attributed to IDU (AIDSVu). State Incidence: There were approximately 93 new cases of acute HCV (0.9 per 100,000 persons) reported in Georgia in 2016 (CDC). State Prevalence: In Georgia, there are an estimated 58,200 persons living with Hepatitis C (2013-2016 annual average), a rate of 770 cases per 100,000 persons (HepVu).